^ a b c d e f Sigma-Aldrich Co., Palmitic acid. Retrieved on 2014-06-02. ^ Beare-Rogers, J.; Dieffenbacher, A.; Holm, J.V. (2001). "Lexicon of lipid nutrition (IUPAC Technical Report)". Pure and Applied Chemistry 73 (4): 685–744. ^ Seidell, Atherton; Linke, William F. (1952). [Google Books Solubilities of Inorganic and Organic Compounds] . Van Nostrand. Retrieved 2014-06-02. ^ Frémy, E. (1842). "Memoire sur les produits de la saponification de l’huile de palme". Journal de Pharmacie et de Chimie XII: 757. ^ Anneken, David J.; Both, Sabine; Christoph, Ralf; Fieg, Georg; Steinberner, Udo; Westfechtel, Alfred (2006). "Fatty Acids". Ullmann's Encyclopedia of Industrial Chemistry. Weinheim: Wiley-VCH. ^ Kingsbury, K. J.; Paul, S.; Crossley, A.; Morgan, D. M. (1961). "The fatty acid composition of human depot fat". ^ Benoit SC, Kemp CJ, Elias CF, Abplanalp W, Herman JP, Migrenne S, Lefevre AL, Cruciani-Guglielmacci C, Magnan C, Yu F, Niswender K, Irani BG, Holland WL, Clegg DJ (2009). "Palmitic acid mediates hypothalamic insulin resistance by altering PKC-θ subcellular localization in rodents". Rats fed a diet of 20% palmitic acid and 80% carbohydrate for extended periods showed alterations in central nervous system control of insulin secretion, and suppression of the body's natural appetite-suppressing signals from leptin and insulin (the key hormones involved in weight regulation). According to the  Retinyl palmitate is an antioxidant and a source of vitamin A added to low fat milk to replace the vitamin content lost through the removal of milk fat. Palmitate is attached to the alcohol form of vitamin A, retinol, to make vitamin A stable in milk. Recently, a long-acting antipsychotic medication, paliperidone palmitate (marketed as INVEGA Sustenna), used in the treatment of schizophrenia, has been synthesized using the oily palmitate ester as a long-acting release carrier medium when injected intramuscularly. The underlying method of drug delivery is similar to that used with decanoic acid to deliver long-acting depot medication, in particular, neuroleptics such as haloperidol decanoate. Hydrogenation of palmitic acid yields cetyl alcohol, which is used to produce detergents and cosmetics. Palmitic acid is used to produce soaps, cosmetics, and release agents. These applications utilize sodium palmitate, which is commonly obtained by saponification of palm oil. To this end, palm oil, rendered from palm tree (species Elaeis Guineensis), is treated with sodium hydroxide (in the form of caustic soda or lye), which causes hydrolysis of the ester groups. This procedure affords glycerol and sodium palmitate. Excess carbohydrates in the body are converted to palmitic acid. Palmitic acid is the first fatty acid produced during fatty acid synthesis and the precursor to longer fatty acids. As a consequence, palmitic acid is a major body component of animals. In humans, one analysis found it to comprise 21–30% (molar) of human depot fat, and it is a major, but highly variable, lipid component of human breast milk. Palmitate negatively feeds back on acetyl-CoA carboxylase (ACC), which is responsible for converting acetyl-CoA to malonyl-CoA, which in turn is used to add to the growing acyl chain, thus preventing further palmitate generation. In biology, some proteins are modified by the addition of a palmitoyl group in a process known as palmitoylation. Palmitoylation is important for membrane localisation of many proteins. 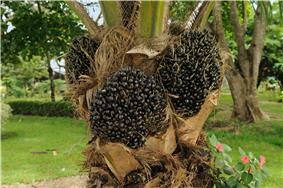 Palmitic acid is naturally produced by a wide range of other plants and organisms, typically at low levels. It is naturally present in butter, cheese, milk and meat also as well as cocoa butter, soybean oil and sunflower oil. The cetyl ester of palmitic acid (cetyl palmitate) occurs in spermaceti. Palmitic acid was discovered by Edmond Frémy in 1840, in saponified palm oil. This remains the primary industrial route for its production, with the triglycerides (fats) in palm oil being hydrolysed by high temperature water (above 200 °C or 390 °F) and the resulting mixture fractionally distilled to give the pure product. Aluminium salts of palmitic acid and naphthenic acid were combined during World War II to produce napalm. The word "napalm" is derived from the words naphthenic acid and palmitic acid.